Regardless of your mountain plans, it’s always a good idea to pack a little extra for plan B. That extra pair of rock shoes in the car might end up saving the day. The North Face Base Camp Duffel has become my go-to gear hauling solution. For the past 10 years, it has stood up to week-long trips and hauled everything from clothing to ice screws. We currently have 3 Base Camps in use in our house and they all get used regularly. The most useful sizes have been the Medium and Large. Nothing is more frustrating then almost fitting everything in a duffel. At 75 and 90 liters of storage, they offer plenty of room. The XL size is the perfect solution for multi-week expeditions. At 155 liters, you won’t be paying for that extra piece of luggage (based on size anyway!). Our duffels have hauled gear and traveled to Norway, Alaska, British Columbia, Iceland and more. They have served as extra storage on long bike tours and for transporting scuba equipment. Pushing the bike through some snowy roads across the largest alpine plateau in Europe, Finse, Norway. The layout of the inside of the duffel is simple; a three-quarter zip opens the main compartment and the lid holds a zippered pocket. This is handy for storing small items, but can hinder the closing of the lid when stuffed full. Two removable shoulder straps are suitable for a short carry in the airport but without a hip belt not recommended for extended carries. This can hardly be considered a negative; after all, this is a duffel, not a 90L backpack. A cool detail is the velcro on the shoulder strap. Not sure if North Face intended it this way, but it nicely holds the adjustment straps of the shoulder strap. This is especially nice when flying with the duffel. Velcro to hold the shoulder strap adjustment webbing. On the outside, two beefy grab handles on each side ease moving the bag. I have come to appreciate the extra material on the handles, especially when it is full. Daisy-chain stitching runs along both long sides of the duffel, providing convenient lash-down options. Personally, these have been most useful when moving extra equipment by bike or on a vehicle’s roof rack. Reinforced grab handle and daisy chain allow for plenty of tie-down options. The main, coloured fabric of the duffel is a type of thermoplastic (TPE). A big advantage of this type of plastic is that it is both pliable (even in -30C) yet tough. Though not particularly light, it is exceptionally durable, waterproof and phthalate-free (chemicals used in PVC and other plastics). It is good to see companies moving to more environmentally friendly materials. 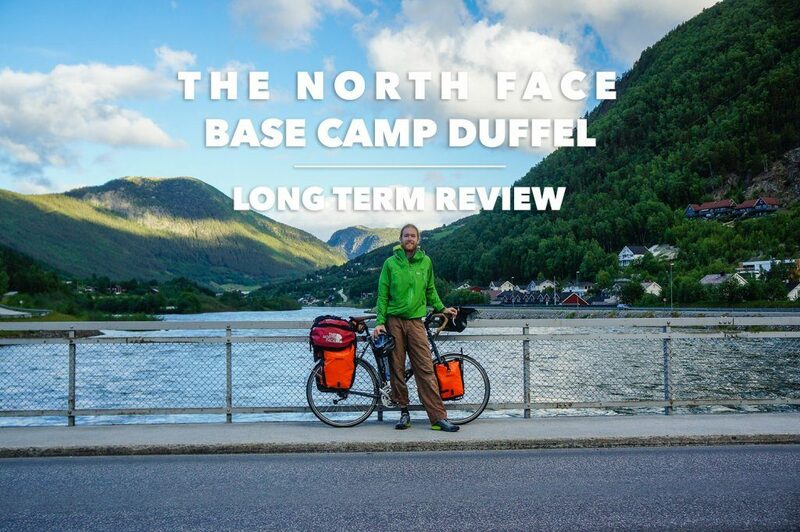 It seems like The North Face has tried several materials over the years, about 6 years ago the Base Camp duffel still used a PVC nylon laminate. The base of the duffel is reinforced with 840D ballistics nylon, overtop of the TPE fabric. The Medium size duffel easily holds enough gear for a 3-day alpine climbing trip for two people. While The North Face is not marketing the duffel as waterproof, it can be considered highly water resistant. Since the stitching goes through the heavy-duty nylon, there is a chance that water will eventually leak through. This author has used Seam Grip on the inside stitching to improve the waterproofness. With this improvement, the duffel has sat in puddles for hours without soaking through. The one (non-waterproof) zipper is protected by a solid overlap to prevent leaks. Drying gear below Quebec’s most impressive big wall, Cap Trinité, Saguenay Fjords, Quebec. At 1600g, 1820g and 2240g for the M, L and XL sizes (respectively), these duffels will never win any fast-and-light awards. However, invest in one of these bright duffel and you will be using it for a lifetime to come. Two compression straps on either side allow you to cinch down the bag. The small nick beside the strap is the biggest tear I’ve gotten in over 10 years.